Since isotopic ratios of H, C, and N are sensitive indicators for determining extraterrestrial organics, we have measured these isotopes of Hayabusa category 3 organic samples of RB-QD04-0047-02, RA-QD02-0120, and RB-QD04-0001 with ion imaging using a NanoSIMS ion microprobe. All samples have H, C, and N isotopic compositions that are terrestrial within errors (approximately ±50‰ for H, approximately ±9‰ for C, and approximately ±2‰ for N). None of these samples contain micrometer-sized hot spots with anomalous H, C, and N isotopic compositions, unlike previous isotope data for extraterrestrial organic materials, i.e., insoluble organic matters (IOMs) and nano-globules in chondrites, interplanetary dust particles (IDPs), and cometary dust particles. We, therefore, cannot conclude whether these Hayabusa category 3 samples are terrestrial contaminants or extraterrestrial materials because of the H, C, and N isotopic data. A coordinated study using microanalysis techniques including Fourier transform infrared spectrometry (FT-IR), time-of-flight secondary ion mass spectrometry (ToF-SIMS), NanoSIMS ion microprobe, Raman spectroscopy, X-ray absorption near edge spectroscopy (XANES), and transmission electron microscopy/scanning transmission electron microscopy (TEM/STEM) is required to characterize Hayabusa category 3 samples in more detail for exploring their origin and nature. The Hayabusa spacecraft brought back samples from the asteroid Itokawa to Earth on 13 June 2010. More than 1,500 particles (composed of olivines, feldspars, Ca-pyroxenes, troilite, chromites, phosphates Fe-Ni metal grains, and other materials) have been identified ranging from 10 to 300 μm, with most being smaller than 50 μm (Nakamura et al.2011; Tsuchiyama et al.2011). 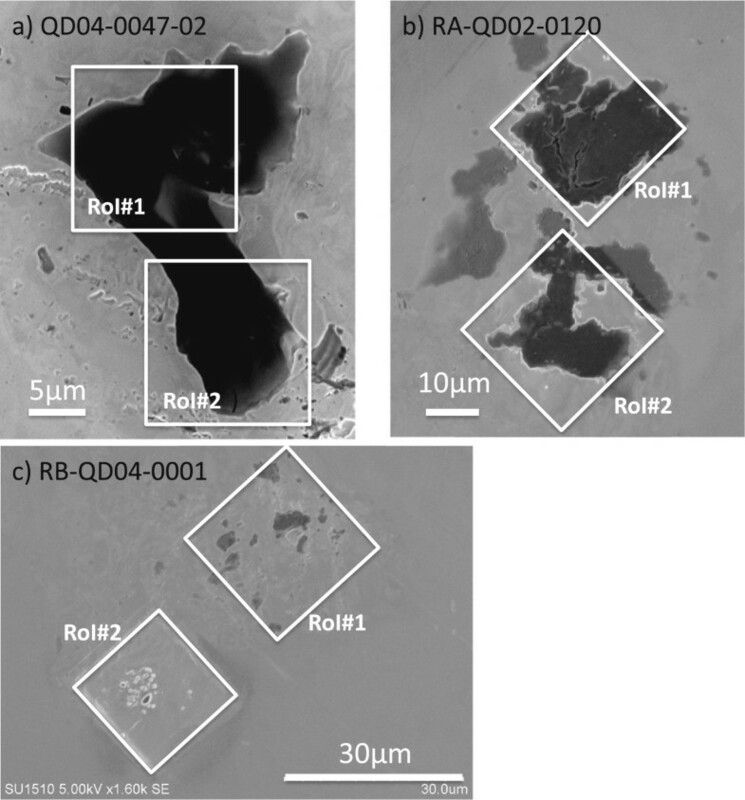 Some carbonaceous material (hereafter Hayabusa category 3 samples) was found on the basis of a field emission scanning electron microscopy (FE-SEM) with energy-dispersive spectroscopy (EDS) observation at the Japan Aerospace Exploration Agency (JAXA) Extraterrestrial Sample Curation Center (ESCuC) (Uesugi et al.2014). These category 3 samples are mainly composed of C, N, and O; some of them also contain NaCl and KCl (Uesugi et al.2014). Initial investigations of the rocky materials have confirmed that they are asteroid samples, and the petrographic type of Itokawa is 4 to 6 in the LL or L ordinary chondrite group through mineralogical and isotopic studies (Nakamura et al.2011; Yurimoto et al.2011). However, category 3 samples have not been fully investigated, and it is not yet clear whether they are terrestrial contaminants or extraterrestrial materials. H, C, and N isotopic compositions of extraterrestrial organic materials in Stardust cometary samples (Mc Keegan et al.2006; Sandford et al.2006), interplanetary dust particles (IDPs) (e.g., Messenger2000), insoluble organic matter (IOM) (e.g., Busemann et al.2006), and organic nano-globules in primitive chondrite (Nakamura-Messenger et al.2006) provide evidence about the origin and nature of the early solar system. Large D, 13C, and 15N isotopic enrichments have been observed in many extraterrestrial organic materials (e.g., Messenger2000; Busemann et al.2006; Nakamura-Messenger et al.2006; Pizzarello2006; Alexander et al.2007). These isotope data suggest that extraterrestrial organics are probably interstellar material that survived the formation processes of the solar system (e.g., Sandford et al.2001) or material that formed in the cold outer regions of the protoplanetary disk (Aikawa et al.2002). Recently, Remusat and Piani (2013) reported H and N isotopic distributions of IOMs in ordinary chondrites of Semarkona (LL3.0), Bishunpur (LL3.15), and GRO95502 (LL3.2). They found that D and 15N enrichments and their spatial distributions in the IOM of ordinary chondrites show differences from those in the IOMs of carbonaceous chondrites. Briefly, IOM in carbonaceous chondrites contains many micrometer-sized D- and 15N-rich anomalies (hot spots) mixed with moderately enriched isotopically anomalous organic material. In contrast, IOM in ordinary chondrites shows heterogeneous distributions of D and 15N isotopes in wider areas and a few micrometer-sized hot spots. The D/H variations of IOMs in ordinary and carbonaceous chondrites are complex and may be due to different secondary alteration processes on their parent bodies (Alexander et al.2010), possibly with a small contribution of extremely D-enriched presolar organic materials for ordinary chondrites (Aléon2010). 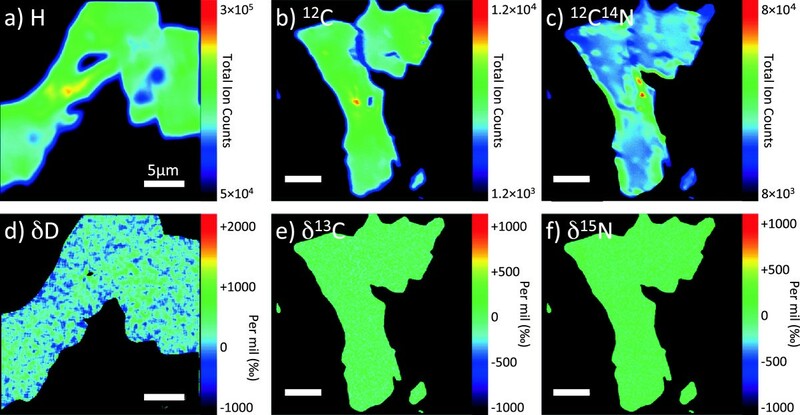 Here we report H, C, and N isotopic measurements of organic materials from the Hayabusa category 3 samples, RB-QD04-0047-02, RA-QD02-0120, and RB-QD04-0001, by ion imaging with the Japan Agency for Marine-Earth Science Technology (JAMSTEC) NanoSIMS ion microprobe. The purposes of this study are (1) to find extraterrestrial organic materials on the basis of H, C, and N isotope measurements and (2) to evaluate the potential for terrestrial contamination from the Hayabusa spacecraft and/or at the time of sample processing/handling in the JAXA ESCuC, in order to avoid potential contamination for the future Hayabusa 2 spacecraft and curation operation. The Hayabusa category 3 organic samples used in this study were initially investigated with FE-SEM equipped with an EDS detector (Hitachi S4300 and SU6600, Hitachi High-Technologies Corp., Minato-ku, Japan) at JAXA ESCuC. The EDS spectra of the samples contain C, N, and O, with C and N being dominant (Uesugi et al.2014). Each Hayabusa category 3 sample was pressed into a Au plate on half-inch-sized SEM stubs together with terrestrial organic standards of 1-hydroxybenzotriazole hydrate (C6H5N3O·x H2O) and BBOT (C26H26N2O2S) with known H, C, and N isotopic ratios (Uesugi et al.2014). The sample mounts were then sent to the Kochi Institute for Core Sample Research, JAMSTEC. A thin Au coating (20 nm) was applied to the surfaces to eliminate electrostatic charge during the SEM and NanoSIMS analyses. We carried out SEM observations (Hitachi SU1510, Hitachi High-Technologies Corp., Minato-ku, Japan) of the three samples, RB-QD04-0047-02, RA-QD02-0120, and RB-QD04-0001, before and after the NanoSIMS measurements. This allows us to check the locations and conditions of the samples and standards on the Au plates over the areas analyzed by NanoSIMS isotope imaging, which were 15 to 40 μm2. The H, C, and N isotopic compositions of the samples were analyzed by isotopic imaging with the JAMSTEC NanoSIMS 50L ion microprobe (Ametek CAMECA, Inc., Gennevilliers Cedex, France). A focused primary Cs+ beam of approximately 1.8 to 2.5 pA for C and N isotopic analysis and 13 to 17 pA for H isotopic analysis was rastered over 15 × 15 to 40 × 40 μm2 areas on the samples. For C and N isotopic analysis, images of 12C−, 13C−, 12C14N−, 12C15N−, and 32S− were acquired simultaneously in multidetection with five electron multipliers (EMs) at a mass resolving power of approximately 9,000, sufficient to separate all relevant isobaric interferences (i.e., 12C1H on 13C). For H isotopic analysis, images of 1H and 2D were acquired using two EMs in multidetection at a mass resolving power of approximately 3,000. Each run was initiated after stabilization of the secondary ion beam intensity following presputtering of approximately 2 to 5 min with a relatively strong primary ion beam current (40 to 45 pA). Each imaging run was repeatedly scanned (10 to 20 times) over the same area, with individual images consisting of 256 × 256 or 512 × 512 pixels. The dwell times were 1,000 to 1,500 μs/pixel for C and N isotopic measurements and 3,000 μs/pixel for H isotopic measurements. The total acquisition times ranged from 20 min to 4 h for each analysis. The isotopic images were processed using the custom-written software ‘NASA JSC imaging software for NanoSIMS’ developed in the Interactive Data Language (IDL) program (Ito and Messenger2008). Data were corrected for EM dead time, which is electronically set to 44 ns, and the QSA effect (Slodzian et al.2004). Different scans of each image were aligned to correct image drift during acquisition. Final images were generated by adding the secondary ions of each image from each pixel over all of the scans. Nearby grains of 1-hydroxybenzotriazole hydrate and BBOT were used for H, C, and N isotopic standards to correct for instrumental mass fractionations (Table 1). The H, C, and N isotopic compositions of the 1-hydroxybenzotriazole hydrate were determined by using an elemental analyzer connected to an isotope ratio mass spectrometer (Thermo Fisher Scientific TC/EA-Delta V Plus ConFloIII system for H isotopes and EA1112-Delta V Advantage ConFloIV system for C and N isotopes, Thermo Fisher Scientific, Inc., Waltham, MA, USA). The precisions of the H, C, and N isotopic compositions are within ±1.5‰ for δD and ±0.1‰ for δ13C and δ15N. For H, C, and N isotopic compositions in BBOT (C26H26N2O2S), we used the same BBOT data published in Hashizume et al. (2011). Isotopic compositions are reported as δ values, representing the deviation of the measured isotopic ratios with reference terrestrial standards in per mil (‰): δ R = R measured R reference − 1 × 1 , 000 . Reference values for H, C, and N isotopic ratios are 0.00015576 for (D/H)SMOW (Hagemann et al.1970), 0.0112372 for (13C/12C)PDB (Craig1953), and 0.003676 for (15N/14N)Air (Mariotti1983). The isotopes of H, C, and N can be used as indicators of the origin and nature of extraterrestrial organic materials. The isotopic compositions of IOMs in the most primitive meteorites and organic materials in IDPs indicate that some may have formed in the presolar interstellar medium or in the outer protoplanetary disk (e.g., Messenger2000; Busemann et al.2006; Sandford et al.2006; Alexander et al.2007). 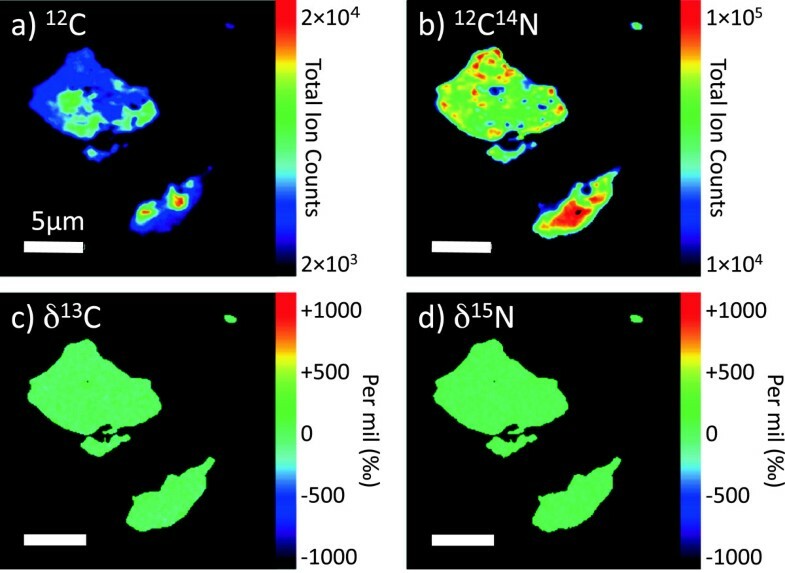 We first have evaluated the analytical conditions, precisions, and accuracy for the isotopic measurements by ion imaging with NanoSIMS through repeated measurement of two terrestrial organic materials, 1-hydroxybenzotriazole hydrate and BBOT. After the measurements of these standards, we measured the H, C, and N isotopic distributions in IOM extracted from the A881458 CM chondrite (Oba and Naraoka2009). The bulk H isotopic compositions (approximately 600‰) of IOM in A881458 are broadly consistent with a previous study by Oba and Naraoka (2009). In addition, several micrometer-sized D-enriched hot spots (δD approximately 2,500‰) were observed in the analyzed area. The C and N isotopic distributions in the IOM are also in good agreement with previous publications (e.g., Pizzarello2006; Alexander et al.2007). The bulk δ13C was +35‰ and few 13C-enriched hot spots were observed (approximately +280‰), while the bulk δ15N was +9‰ and 15N-enriched hot spots (approximately +450‰) were observed. These results indicate that H, C, and N isotope ion imaging with NanoSIMS can be applied reliably to the Hayabusa category 3 samples. We next performed NanoSIMS imaging of H, C, and N isotopes in RB-QD04-0047-02 (Figure 1a), RA-QD02-0120 (Figure 1b), and RB-QD04-0001 (Figure 1c). Figure 1 shows scanning electron images of the samples taken after NanoSIMS analysis. The white outlined regions in Figure 1 show different areas measured in these samples (Table 2). All material was sputtered away from RoI#2 in Figure 1c during the H isotopic analysis whereas some material in other regions survived analysis (Figure 1b,c). Scanning electron images of Hayabusa category 3 samples: (a) QD04-0047-02, (b) RA-QD02-0120, and (c) RB-QD04-0001. Regions outlined in (a) are areas of H isotopic measurements (RoI# 1, RoI# 2a and 2b in Table 2). Regions outlined in (b) are shown in Figure 3 (RoI#1) and Figure 4 (RoI#2), respectively. Regions outlined in (c ) are shown in Figure 5 (RoI#1) and Figure 6 (RoI#2), respectively. Figure 2 shows elemental images of H, 12C, and 12C14N and isotope images of δD, δ13C, and δ15N for RB-QD04-0047-02. The first measurement of H isotopes shows δD of 0‰ to 135‰ (Table 2), broadly in agreement with the terrestrial H isotopic composition within error. The 12C14N image shows heterogeneous distributions whereas the 12C image shows relatively homogeneous distributions in RB-QD04-0047-02 (Figure 2b,c). Distributions of δ13C and δ15N are homogeneous within the sample (Figure 2e,f), and the isotopic ratios are consistent with the terrestrial values within error (Table 2). NanoSIMS ion images of QD04-0047-02. NanoSIMS ion images of (a) H, (b) 12C, and (c) 12C14N and isotope images of (d) δD, (e) δ13C, and (f) δ15N of QD04-0047-02. Time-of-flight secondary ion mass spectrometry (ToF-SIMS) can provide detailed chemical analysis and identification of specific organic compounds (Benninghoven1994). We measured RB-QD04-0047-02 by ToF-SIMS for further characterizations of the organics after NanoSIMS analysis. However, ToF-SIMS analysis for this sample was not successful because most of the observed mass spectra consisted of Cs- and/or Au-related peaks (Naraoka et al.2014), indicating that the ToF-SIMS analysis was clearly affected by the prior NanoSIMS analysis. In order to evaluate the effect on isotope analyses with the NanoSIMS after ToF-SIMS analysis, we analyzed the H, C, and N isotopes again in RB-QD04-0047-02 after the ToF-SIMS analysis. Both the H and δD images in RB-QD04-0047-02 that were acquired after ToF-SIMS analysis show statistical variations, rather than any significant heterogeneity (Figure 2a,d). The isotopic ratios before ToF-SIMS analysis were 103‰ for δD, 3‰ for δ13C, and −4‰ for δ15N whereas those obtained after ToF-SIMS analysis were 177‰ for δD, 14‰ for δ13C, and 6‰ for δ15N (Table 2). Possibly, the effects on isotopic ratios were not really significant except for H isotopes. δD values in organics in carbonaceous and ordinary chondrites are more than several hundred per mil in bulk and few thousand per mil in micrometer-sized regions (e.g., Pizzarello2006; Alexander et al.2007; Oba and Naraoka2009; Remusat and Piani2013). Therefore, we concluded that the proper order for the organic samples should be ToF-SIMS first and then followed by NanoSIMS. This should avoid serious problems (i.e., mass fractionation) on the isotopic distributions in the original sample. RA-QD02-0120 is a relatively large sample, so we chose two regions (25 μm2) for isotopic analysis (Figure 1b, Figure 3 for RoI#1, and Figure 4 for RoI#2). Elemental images of H, 12C, and 12C14N and isotope images of δD, δ13C, and δ15N in Figures 3 and4 show similar characteristics: the 12C image shows heterogeneous distributions whereas the H and 12C14N images show relatively homogeneous distributions (Figures 3a,b,c, and4a,b,c). With respect to the isotope images of δD, δ13C, and δ15N, all three isotopes show homogeneous distributions and have terrestrial values within error (Figures 3d,e,f and4d,e,f and Table 2). NanoSIMS ion images of RoI#1 in RA-QD02-0120. NanoSIMS ion images of (a) H, (b) 12C, and (c) 12C14N and isotope images of (d) δD, (e) δ13C, and (f) δ15N of RoI# 1 in RA- QD02- 0120. NanoSIMS ion images of RoI#1 in RA-QD02-0120. NanoSIMS ion images of (a) H, (b) 12C, and (c) 12C14N and isotope images of (d) δD, (e) δ13C, and (f) δ15N of RoI#2 in RA-QD02-0120. RB-QD04-0001 consists of small fragments scattered across a wide area, so we chose two regions as being typical for the sample (Figure 1c, Figure 5 for RoI#1, and Figure 6 for RoI#2). This sample shows heterogeneous distributions of 12C and 12C14N within the sample (Figures 5a,b and6a,b). It is difficult to reconstruct the H and δD images because the material in RoI#2 sputtered away so quickly during H isotopic analysis. We decided not to measure H isotopes in RoI#1, in order to save these small grains for future analysis with TEM, ToF-SIMS, Raman spectroscopy, etc. All isotopes show homogeneous distributions and have terrestrial values within error (Figures 5c,d and6c,d and Table 2). None of the three samples were found to contain micrometer-sized hot spots with anomalous H, C, and N isotopic compositions (δD, δ13C, and δ15N isotope images in Figures 2,3,4,5,6). NanoSIMS ion images of RoI#1 in RB-QD04-0001. NanoSIMS ion images of (a) 12C and (b) 12C14N and isotope images of (c) δ13C and (d) δ15N of RoI#1 in RB-QD04-0001. NanoSIMS ion images of RoI#2 in RB-QD04-0001. 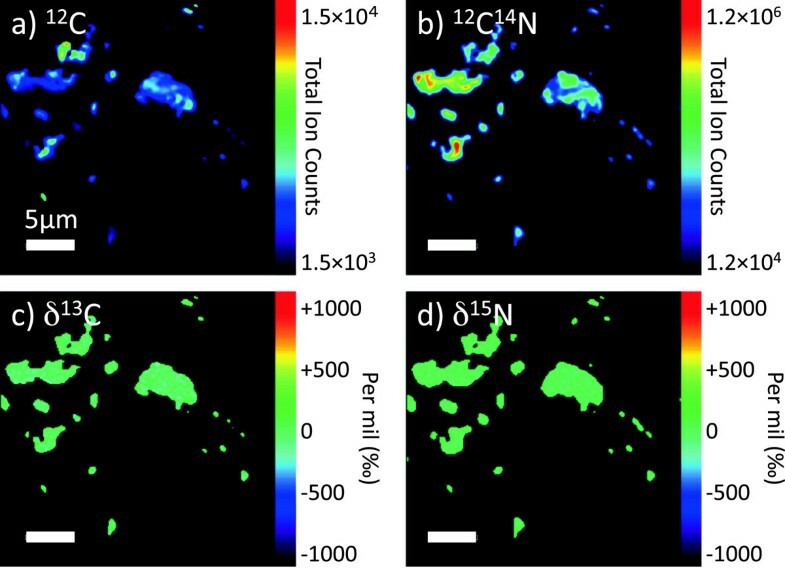 NanoSIMS ion images of (a) 12C and (b) 12C14N and isotope images of (c) δ13C and (d) δ15N of RoI#2 in RB-QD04-0001. H, C, and N isotopic compositions in the IOMs from carbonaceous and ordinary chondrites vary on small spatial scales of few hundred nanometers to few micrometers in size (hot spots), as well as over wide areas in the bulk meteorite (e.g., Busemann et al.2006; Alexander et al.2007; Remusat et al.2009). The isotopic signatures of Hayabusa category 3 organic samples are clearly different from those of IOMs in carbonaceous and ordinary chondrites: (1) there are no micrometer-sized hot spots and spatially homogeneous distributions of H, C, and N isotopes (δD, δ13C, and δ15N isotope images in Figures 2,3,4,5,6), and (2) isotopic ratios are terrestrial within error (Table 2). However, we cannot rule out the possibility that these Hayabusa category 3 organic samples are of extraterrestrial origin since later addition of either micrometeorites with organic materials or IDPs onto the asteroid (Kwok2012; Flynn et al.2013) and thermal metamorphism on parent body formation could have altered or erased initial isotope signatures of organic materials. Nakamura et al. (2012) found sub-micrometer-sized craters on Itokawa particles created by the impact of micrometeorites onto the Itokawa asteroid. Even if the Itokawa asteroid did not contain pristine organic materials, it might have organic materials added by impacts from micrometeorites or IDPs (Flynn et al.2013). However, the isotopic compositions may be altered/erased by heating during the impact process. Thermal metamorphism and aqueous alteration on the parent bodies of meteorites and IDPs can also modify the organic carriers of isotopic anomalies through exchange with isotopically normal materials (Alexander et al.2007). According to Nakamura et al. (2011), Itokawa parent body, which was classified as L or LL4-6 ordinary chondrite, has experienced a peak metamorphic temperature of up to 800°C and cooled slowly to 600°C. Even if the asteroid Itokawa contains pristine organic materials, the original isotopic signature may have been erased and/or altered by thermal metamorphism during parent body formation and evolution. It should be noted that no isotope data is available for the IOMs from petrographic type 4 to 6 of chondrites until now. Further investigation is necessary to explore the origin and nature of these samples by coordinated analysis of focused ion beam (FIB), Fourier transform infrared spectrometry (FT-IR), Raman spectroscopy, C-X-ray absorption near edge spectroscopy (XANES), transmission electron microscopy/scanning transmission electron microscopy (TEM/STEM) ToF-SIMS, and NanoSIMS. This coordinated analysis is essential to acquire maximum information including isotopes, texture, and chemistry from micrometer- to nanometer-scale samples. This technique has been applied to carbonaceous materials by Stardust cometary dust return mission (e.g., Sandford et al.2006; Matrajt et al.2008). We have carried out isotopic measurements of H, C, and N by NanoSIMS ion imaging for three category 3 samples, RB-QD04-0047-02, RA-QD02-0120, and RB-QD04-0001. The isotopic compositions of H, C, and N in these samples show terrestrial values within errors and homogeneous distributions in the samples. We did not find micrometer-sized isotopically anomalous areas (hot spots) of H, C, and N in any of the samples. The H, C, and N isotopic characteristics of the Hayabusa category 3 organic samples are different from those of the IOMs in various types of chondrites, organic materials in IDPs, cometary dust organic particles, and meteoritic nano-globules. It is therefore difficult to conclude, based on the data, whether these Hayabusa category 3 samples are terrestrial contamination or extraterrestrial materials. We plan to apply a new coordinated analytical study (Uesugi et al.2014), including FT-IR, ToF-SIMS, NanoSIMS, Raman spectroscopy, FIB, XANES, and TEM/STEM to the Hayabusa category 3 samples for more detailed characterization. This research was supported by the JSPS Strategic Fund for Strengthening Leading-edge Research and Development to the JAMSTEC. We thank the Hayabusa Project members and curation facility in JAXA for providing the samples. We are grateful to two anonymous reviewers and Dr. Ireland for their comments that helped to improve this manuscript. MI contributed to the NanoSIMS and electron beam data analyses, image data reduction, interpretation, and manuscript preparation. MU, YK, TY, and YI carried out the sample preparation, electron beam analyses, and interpretation. HN and YT performed the isotopic analysis of organic reference materials and interpretation. HY, FK, HM, TO, and MA participated in the design of the research and interpretation. All authors read and approved the final manuscript.